Amir Ali Sadollah (Persian: ??????? ???????) 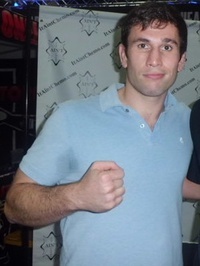 (born August 27, 1980) is an American professional mixed martial artist (MMA). He was the winner of Spike TV's The Ultimate Fighter 7. He has fought exclusively within the confines of the Ultimate Fighting Championship (UFC) Octagon since the beginning of his MMA career, making him one of the few fighters who have done so. This webpage uses material from the Wikipedia article "Amir_Sadollah" and is licensed under the GNU Free Documentation License. Reality TV World is not responsible for any errors or omissions the Wikipedia article may contain.